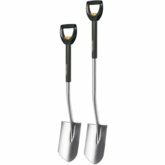 Fiskars Ergonomic Garden Spade (Pointed) has a sharp cutting edge to aerate, stir and turn soil and cut through roots. 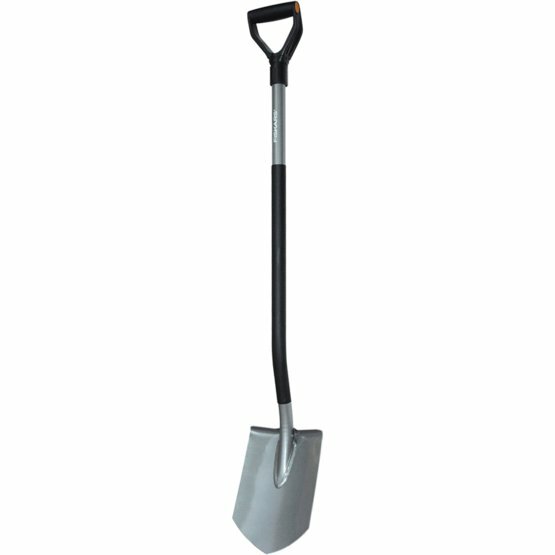 Its design ensures good performance for digging in stony, clay and hard soils. The 17º handle angle of the handle means that the hand remains in a natural position, helping to reduce strain on the hand and wrist while the Y shaped handle helps to ensure a comfortable and firm grip. The tear drop shaped steel shaft with a plastic coating makes it extremely durable and helps to maximise the grip and insulates from the cold. The sturdy welded connection between the blade and the shaft ensures rigid durability while the Boron steel construction adds extra strength and makes penetration into the soil easier. The lifting angle of 26º has been designed for optimal digging performance.